This anatomically detailed model of the foot and lower leg can be disassembled into 6 removable parts for detailed study of the foot and ankle. The foot skeleton features not only the bones but also the muscles, tendons, ligaments, nerves, arteries, and veins of the foot. The frontal view of the foot model features the extensor muscles of the lower leg. The tendons can be followed on their passage under the transverse and crucial crural ligaments all the way to their insertion points. In addition all tendon sheaths of the foot area are visible. On the dorsal portion of the footl the gastrocnemius muscle is removable to reveal deeper anatomical elements. The sole of the foot is represented in three layers; the first layer displaying the flexor digitorum brevis. This muscle can be removed from the foot revealing the quadratus plantae, the tendon of the flexor digitorum longus, and the flexor hallucis muscle. This second layer is in turn removable to display even deeper anatomical details of the foot. 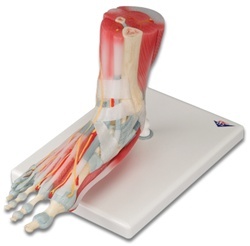 This foot skeleton model with ligaments and muscles is the best of its kind in quality and value. The item is well detailed. The detachable sections allow for a clear understanding of what is hidden beneath other muscles and tissue. I'm a Podiatric medicine student and this foot has been a great resource for studying Lower Limb Anatomy. I highly recommended it. I use it all the time, and hope to use it in my future practice.